Dr. Elizabeth Kuan graduated in 2014 from the University of Melbourne, Australia. She moved back home to Vancouver and worked as a full-time General Practitioner for a couple years. To gain more experience she left her full-time position to locum at a number of GP clinics around the Lower Mainland, as well as worked as a hospitalist at a local referral centre. Since starting at Burnaby Veterinary Hospital she has re-discovered how rewarding GP work can be. She enjoys the relationships she forms with her clients and loves receiving updates on how her patients are doing. And although she loves an intriguing emergency case, emergency vets don’t have the added bonus of cute, healthy puppy and kitten visits! 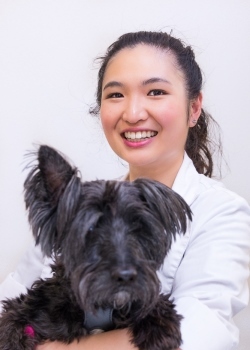 Dr Kuan has always loved dogs and has a “scottie-poo” at home. She did, however, fall in love with her housemate’s cat when she was away at school and now loves both species equally. When not working, Dr Kuan is a lowly servant to her King-of-the-House dog, Oreo. Together they go on long walks, watch countless TV dramas, and gorge themselves on treats.